Raking, sowing seeds and harvesting carrots. 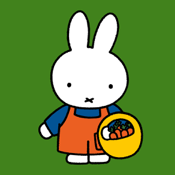 Miffy has her own garden and you can help her with it. Listen to the story and you will know exactly what to do. Miffy in the garden is a fun and educational iPhone app developed specifically for toddlers and pre-schoolers. Very young children can enjoy listening and watching while older children can participate more actively in the story and the game. - First Miffy iPhone app! - Miffy has her own garden, can you help her with it? Raking, sowing seeds, and watering the garden too. Watch as the plants appear…. it’s time to harvest them. And then…enjoy a feast! - Counting: counting carrots. Are you counting along out loud? And did Mother and Father Bunny also get a tasty carrot? Search for miffy in the App Store to find all available miffy apps. Sanoma Media Netherlands b.v. developed this app in collaboration with Mercis b.v.